NASA engineers check out the Inflatable Re-entry Vehicle Experiment (IRVE) in the lab. 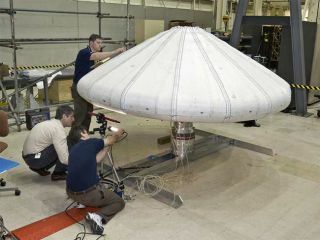 NASA launched an inflatable spacecraft heat shield on Mondayto test the technology for use on future space missions. The test flight lofted a vacuum-packed shroud atop a smallsounding rocket from NASA's Wallops Flight Facility on Wallops Island, Va.Several minutes after liftoff, the shield inflated to a 10-foot-diameter (3 m) mushroomshape, and fell back down to Earth. The experiment showed that such a device could be used toslow and protect a space capsuleas it enters the atmosphere at hypersonic speeds. The material - several layersof silicone-coated Kevlar - could be used to insulate a crew and cargo from thesearingtemperatures of re-entry. "This was a huge success," said Mary Beth Wusk,project manager for the Inflatable Re-entry Vehicle Experiment (IRVE), based atLangley. "IRVE was a small-scale demonstrator. Now that we've proven theconcept, we'd like to build more advanced aeroshells capable of handling higherheat rates." Today's test flight was the first time anyone hassuccessfully flown an inflatable re-entry capsule, according to engineers atNASA's Langley Research Center. The experiment flew to an altitude of 131 miles atop a BlackBrant 9 rocket. After a four-minute climb, the shield was released from itscover and was pumped full of nitrogen in less than 90 seconds. "Everything performed well even into the subsonic rangewhere we weren't sure what to expect," said Neil Cheatwood, IRVE principalinvestigator and chief scientist for the Hypersonics Project of NASA'sAeronautics Research Mission Directorate's Fundamental Aeronautics Program. "The telemetry looks good. The inflatable bladder held up well." Scientists are interested in using similar shields to helpland large objects onMars. "We'd like to be able to land more mass on Mars,"Cheatwood said. "To land more mass you have to have more drag. We need tomaximize the drag area of the entry system. We want to make it as big as wecan, but the limitation has been the launch vehicle diameter." The idea of inflatable decelerators has been around for 40years, Cheatwood said, but until now did not seem practical because of concernsover whether materials could withstand the heat of re-entry. Over timematerials have advanced enough to make the concept plausible. In addition, agreater understanding of the Martian atmosphere gleaned from Mars rovers,landers and orbiters, indicates that the plan has potential.